Growing up in my New York home in the 1960’s & 70’s, I was obsessed at an early age by some of the pieces of furniture in my parent’s home. Credenzas, desks, & chairs with simple design elements yet high style. I have designed several pieces in the mid mod style over the years, and am back at it again. I am adding to the collection this cherry credenza w/ walnut drawers & large walnut door pulls. Veneering is a specialty, so like all of my pieces, the wood grain runs continuously across the top & down each side as well as there being a pleasing book match across the door fronts. The 5” diameter solid walnut pulls look & feel beautiful. 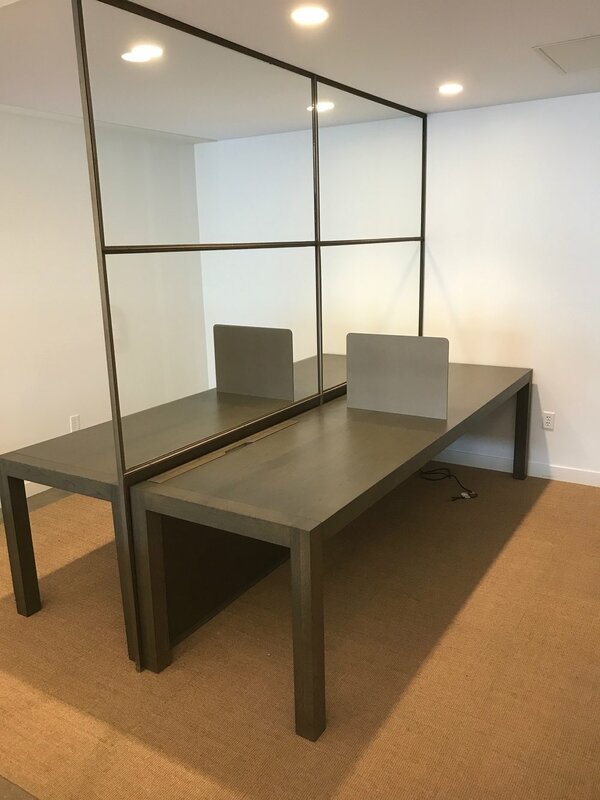 A conference table for the main room of their new offices, as well as two large table work stations for the rear of the offices. Simple & elegant. A few months back I built this custom maple desk based on an architect's drawing. 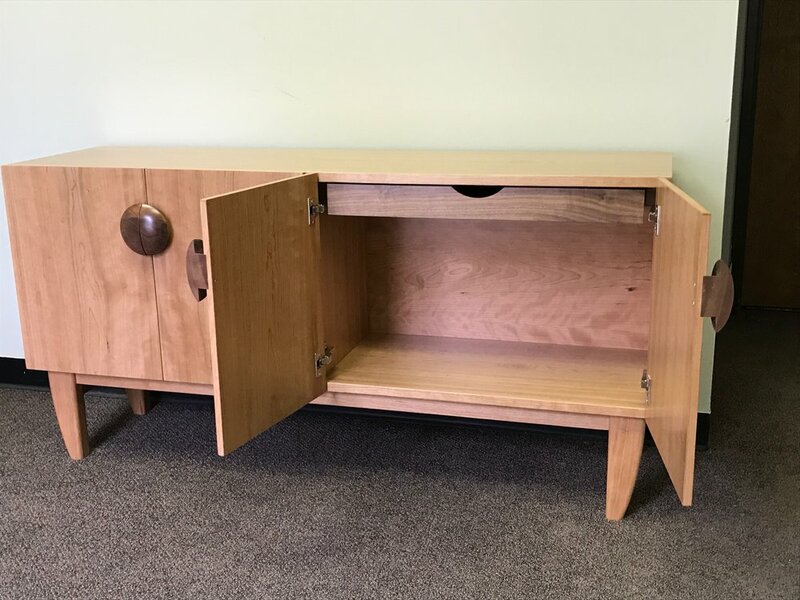 Super simple design, but heavy & substantial for it's place in the office. Delivered in three parts and assembled on site, an elegant piece with some weight. An ultra modern space needs touches of raw material to keep it grounded. into a super clean environment, and it works really well. 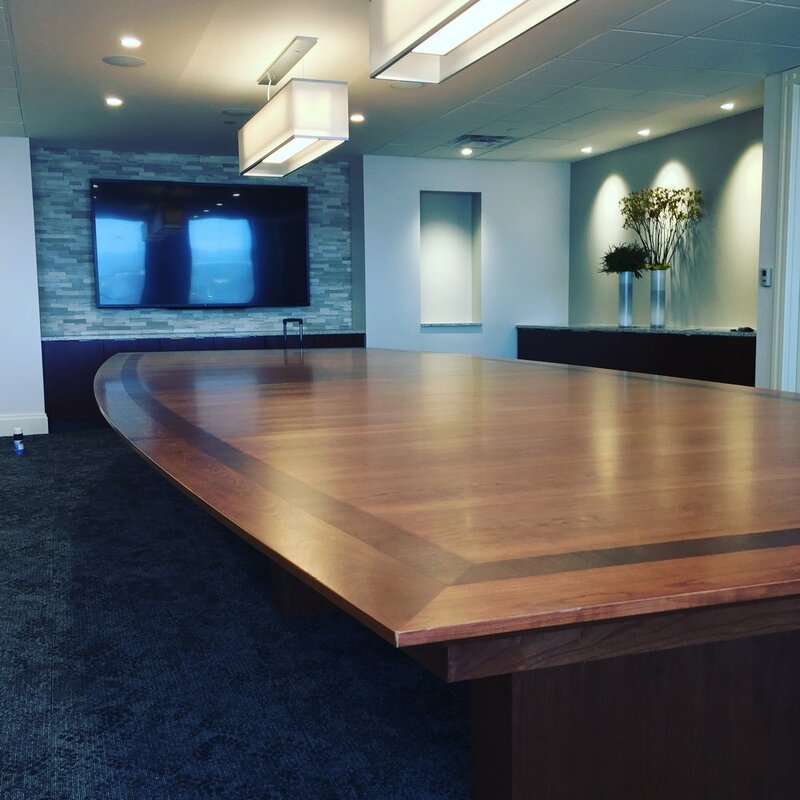 This beautiful claro walnut conference table was built in 2012 for the Anderson Hemmat law firm. Check out the refinishing completed just this morning. This little unit is simple enough, the challenge in an old 1920's home like this is how out of square are the walls it's being attached to? 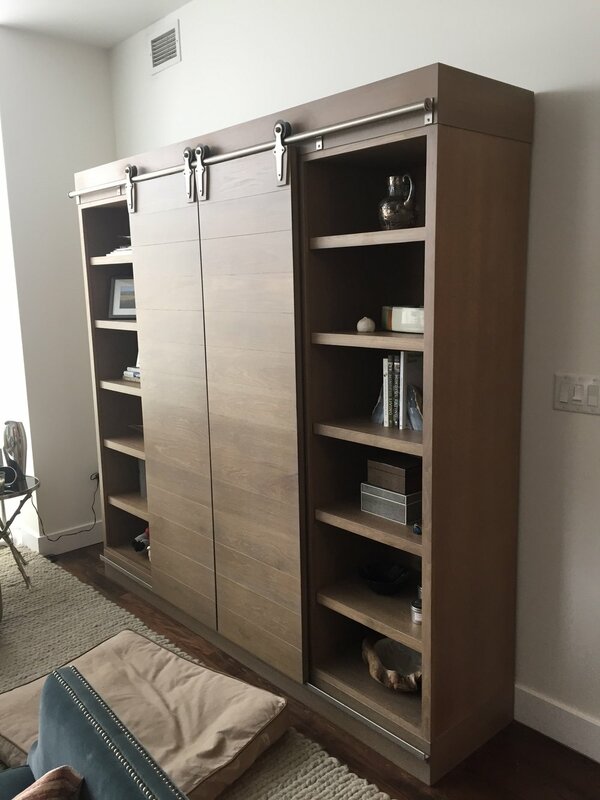 The installation can be the worst part if floors and walls go diving in all directions, but this space was in remarkably good shape & the install went real well. The maple matches their kitchen and has a clean beautiful look. This Redwood Slab Conference Table, completed in Autumn of 2017, is 20' in length X 6' in width, constructed using a total of six redwood slabs, and has three large redwood veneered pedestals. Power is distributed to data ports on the table's top through a hidden wire chase on the underside. Completed mid Summer of 2017, these mirror image etageres for a client in South Denver were a challenge in many ways, but they did turn out beautifully. The pieces are all right angles, so all the joinery is very simple and straight forward, woodworking 101 stuff. The trick in a piece like this is knowing in which order to work. What to attach where and exactly when and after which steps have been completed first. You always have to think three or four steps ahead. I love my work, but I find it difficult to sit down and write something about it. It;s the process that is exciting, the getting there that is what is important, but I'm told I should document these things, so here goes. 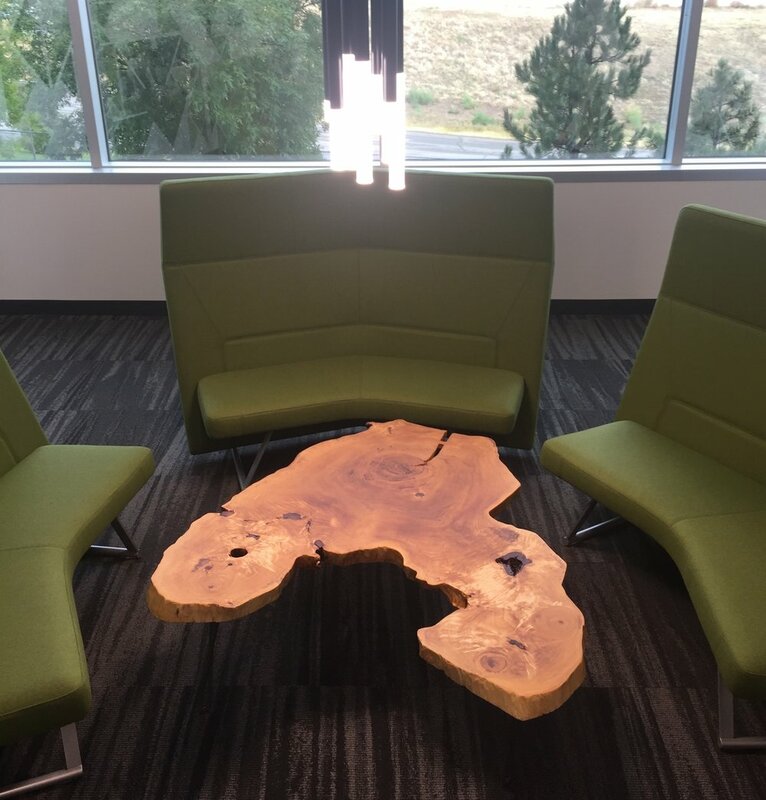 Installed early this Summer in it's home on Wynkoop St. across from Union Station in downtown Denver, this 21' x 8' boat shaped conference table is the largest Mori Furniture has ever designed & built. Four top sections & four diamond shaped pedestals make up this big beautiful monster. 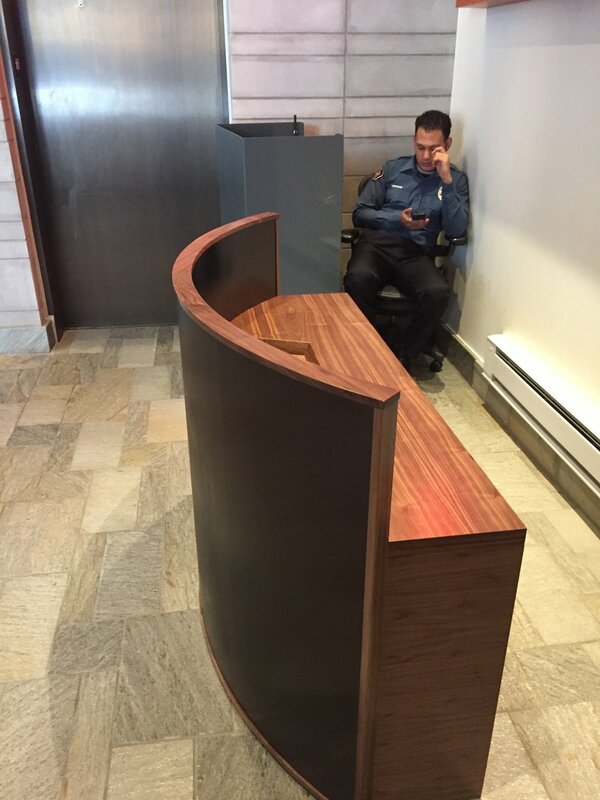 The top is fabricated from solid cherry and utilizing 1/16" thick cherry & mahogany veneers for the overall top design. The table apron houses 12 data ports allowing the table top to be completely clear and leaving it with an unobstructed expansive look. Projects like this are super challenging, & very rewarding. I love my job. Close to one year ago, I was contacted by folks at the Denver Forestry dept. They had been removing diseased walnut trees from parks and neighborhoods for years and wanted to give new life to these beautiful woods. After taking down the largest walnut tree in Wash. Park, milling and kiln drying it, we are presently fabricating two beautiful conference tables for the city. Pictured is a 10.5' diameter table top for the forestry department. A base will be built as well, as soon as these large timbers are dry. We are also working on a 12' x 4' conference table for the Parks Department. I will add to the blog about these tables as these pieces move forward.